You are here: Home 2012 October What Router-switch.com Prepared for Its 10th Anniversary? What Router-switch.com Prepared for Its 10th Anniversary? Router-switch.com, ten years old, happy birthday! 2012 marks the tenth anniversary of router-switch.com, which is an exciting moment for all router-switch’s staff and clients. Router-switch.com has become a world’s leading Cisco supplier over the past ten years with the help of its staff and customers. To celebrate its 10 years, router-switch.com offers some activities for all the old and new clients, for example, big discount (save up to 75% off) for the popular Cisco items (including Catalyst 3560x Series, Cisco Catalyst 3750x Series, Catalyst 3560V2/3750V2, Cisco 2900&3900 Routers, Network Cards, etc. ), fill out a simple survey to win a big gift (Cisco AIR-AP1131AG-A-K9, limited edition T-shirts and 20PC U disk). The activity date is from September. 01. 2012 to October. 31. 2012. 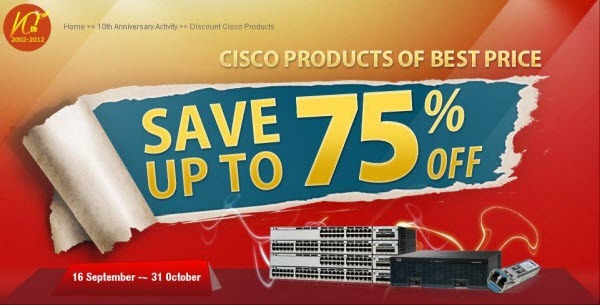 Wow, if you are a Cisco buyer, don’t miss this chance. Let’s join the party to celebrate the 10th birthday together. How to Take Part in this Big Party for Router-switch.com’s 10th Anniversary? How the Router-switch.com Became the World’s Leading Cisco Supplier? 2003, Router-switch.com has experienced a rapid development. 2004, CCIE technical support team was built. 2005, The sales volume maintains 70% growth per year. 2006, Staff in company increased to 20. 2007, Router-switch.com established its marketing department. It attained its reputation in providing timely information of Cisco for clients and Cisco users. 2008, Router-switch.com adopted necessary advanced management tools to improve its service for clients. 2009, Router-switch.com upgraded warehouses in Hongkong and Mainland China. Its inventory is worth over $5 million. 2010, The sales of Router-switch.com have zoomed to $ 30 million. 2011, Router-switch.com released the new version to update service. It supplies free CCIE support. Social network platforms were opened to communicate with customers and clients well. 2012, New Office of router-switch.com landed in US to offer professional local service. Nowadays, router-switch.com is becoming the world’s largest Cisco reseller online. It believes that router-switch.com will be more professional, more reliable and stronger with your support.